MicroSummary: Selling is human, and it’s something we do all the time, nonstop! Most of us, one way or another, are always trying to convince people to take action or change their habits. One way or another, we are all salespeople, and most modern jobs require day-to-day sales skills. Daniel Pink understood that and offered us this book on the art of influencing and persuading others. It’s something that courses through our veins. We do it for a purpose; we do it involuntarily. Every day each of us sells all kinds of stuff (thoughts, things, ideas) to others. 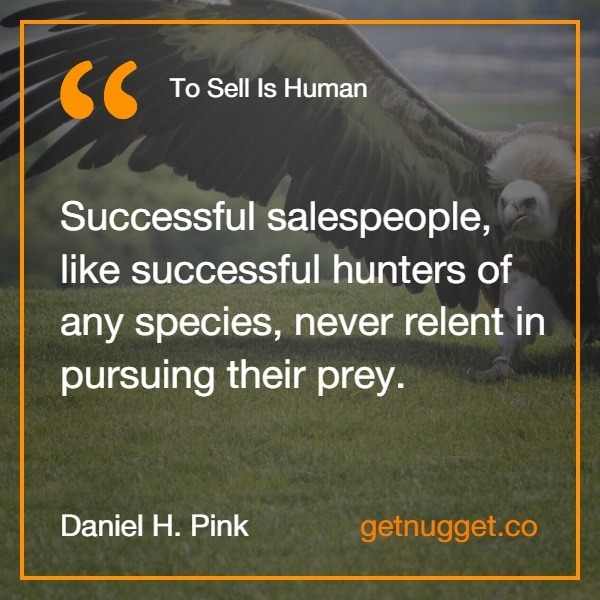 Daniel Pink explains how in To Sell is Human. 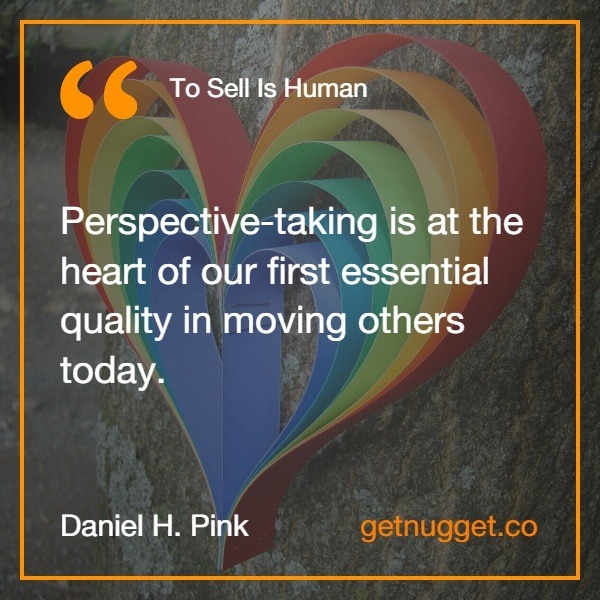 Read on to find out why Daniel Pink thinks that “selling” is in our very nature. Funny information leaked out astonishing facts – the author of “To Sell is Human” Daniel Pink Pinpoints Labor Statistics results in this book. 10% of U.S population is integrated into sales (take into consideration that these numbers are official – the unofficial stats are way higher). What encourages people to pursue the philosophy no one can say for certain. Perhaps it is in our genes. What worries him is that this number decreases over the years. Pink refers to one big dilemma of which actually fall under the sales category. Making a sale is only one aspect of the entire process. Presenting the goods, influencing other people and ultimately convincing them to buy are also vital parts of the sales procedure. Mysteriously named by the author “non-sales selling.” “To Sell is Human” is a book which indicates the importance of a sales nation. This book summary will embolden you to make the first steps towards rediscovering your “sales” identity. The capacity to sell isn’t some unnatural adaptation to the merciless world of commerce. It is part of who we are. Daniel H. Pink is a behavioral expert with a background in politics and economics (he was a chief speechwriter for then-Vice President Al Gore). 18 years ago he left all that behind, deciding to strike out on his own instead. Whether it’s selling’s traditional form or its non-sales variation, we’re all in sales now. Since then the business and technology environment has gained revolutionary insight from him. Five of his books (including To Sell is Human) have appeared on The New York Times Best Seller list. The praise his writings have received and the millions of volumes sold around the globe, along with his extremely popular TED Talk and his valued articles and lectures, all stand to prove Daniel Pink’s unique vision. Hope that got your attention! This is a man who knows what he’s talking about. The main aim of To Sell is Human is to change everything you thought you knew about selling. Everything you thought you knew about it is being dismantled and rearranged in an unexpected manner. In the last 10 years, the art of selling has suffered some major changes, mostly due to the technology boom. Pay attention: it hasn’t disappeared but changed. Pink sheds light on the art of selling in order to help you become more efficient in this new world. He goes to the very core of the implications of being a (successful) salesperson in the 21st century and has the research to back his statements up every step of the way. Whatever our profession, we deliver presentations to fellow employees and make pitches to new clients. The non-sales selling is developing at a more rapid pace than traditional sales. Caveat venditor – the seller is accountable for its products/services – is the law these days. The new ABCs of moving others are Attunement, Buoyancy, and Clarity. Make it personal and make it purposeful. In today’s digital world, the elevator pitch is useless. Improvisation Theater develops a salesman’s persuasive potential. To Sell is Human is comprised of three parts, each made up of three chapters. The 1st part reexamines the sales, by identifying the mutations made by the expansion of the Internet. Across a range of professions, we are devoting roughly twenty-four minutes of every hour to moving others. More is discussed on the rise of entrepreneurship, Ed-Med (Education and health services), and elasticity among enterprises. Pink also depicts the road from caveat emptor to caveat venditor, with the assistance of compelling case studies. The 2nd part explains the most valuable qualities for an effective salesperson – the new ABCs: Attunement, Buoyancy, and Clarity. At the end of each chapter tips, tests, and useful sample cases are presented. In the last chunk of Pink’s book the inner workings of how to pitch, improvise, and services are exposed. The one-word pitch. Think of only one word that describes your brand, idea, or product. Nowadays people’s attention spans are very limited. Make your time count. The question pitch. Questions make people more prone to give you an answer. It’s a call to action. A statement can be taken passively, without any intention of involvement. Still, make sure to have a strong choice of words. We wouldn’t want to backfire, would we? The rhyming pitch. The secret is in our brain’s modus operandi. It processes rhymes fluidly, easily. Rhymes stick with us, even when we don’t want them to. The subject-line pitch. Some days you receive dozens of e-mails. What makes you open one? A great subject line. When composing your own follow these tips: utility, curiosity, and specificity. The Twitter pitch. It’s straightforward, succinct, and easy to respond to. In 140 characters or less you can capture the essence of your idea, making it more appealing to those who don’t want to spend countless hours in conferences. And they can respond at the click of a button. The Pixar pitch. Composed of 6 consecutive sentences, this is the one I find most appealing. Maybe because of the storytelling aspect of it, which helps us reconnect with our childhood bedtime stories: “Once upon a time… every day… one day… because of that… because of that… until finally…”. Hear offers. You must put yourself in the shoes of the person in front of you to fully understand their point of view. The focus must be on them, not you. Say “Yes and.” It gives you possibilities and opportunities, a place to start. This way you are searching for a solution, not trying to demolish the whole idea by finding the plot holes. Make your partner look good. Always find mutual benefit. Go past the “I want the bigger piece of the cake” train of thought. It never ends well. Honest relationships bear more fruit in the long term than two ships passing in the night. And you know it. These are crucial in defining your objective and strategy. Your Teacher and Your Doctor Also Sell! Education and health are the most significant sectors of the American economy and are expanding, generating more and more jobs. In these sectors, changing people’s habits is extremely important, becoming part of the work of professionals. A doctor has to persuade his patients to quit smoking or have a healthier diet. Teachers have to convince their students to study harder and have more commitment. Strangely enough, we do not commonly associate these professions with sales. The great truth is that almost every professional today has at least a little sales in their activities. Yes, that’s right: you work in sales! Time to forget that negative image of the charming seller who takes his money in exchange for a poor product. If there was once a great asymmetry of information between the seller and the customer, today this is no longer the reality. The internet has changed the way people buy and dramatically reduced this asymmetry for two main reasons. The first is the buyer’s ability to research, compare and understand the differentiation of online products, their values, and characteristics. The second aspect is that a bad seller or bad character is easily exposed on the internet today. The Internet has made honesty and transparency vital to salespeople and has shifted its role from information guardian to an advisor seeking to help the client amid the avalanche of information available online. When the buyer knows more than the seller, the seller becomes curator and appraiser of information. For your teacher and your doctor, things have also changed. They are no longer the guardians of knowledge about historical themes or diseases. Today, students often learn on YouTube, on social networks, and on online educational sites. Furthermore, the patient often already arrives at the consultation saying that all the symptoms he presents fit into a specific illness. According to many social science research, tuning, fluctuation, and clarity are the new skills needed to move people into the 21st century. Tuning is our ability to see things from other people’s point of view and act upon them and the context, being vital to our ability to move other people. Getting people to move today depends on entering their minds and seeing the world through their eyes. Tuning means understanding what others are thinking, and should not be confused with empathy, which means understanding what others are feeling. To develop your attunement, begin your meetings and meetings as if you were in a position of less power over the other. That will make you see the perspective of the other more clearly, and this will help you move it in the desired direction. It is essential to have a clear understanding of the others involved in the decision, but it is even more important to understand your concerns and preferences. Another best practice to increase our attunement is to adjust our tone of voice and vocal patterns to understand and be understood by the other. The best sellers, according to Pink, are less sociable than those who perform below average. The stereotype says that successful sellers are always outgoing, but research shows that being too outgoing can actually hurt sales. A sociable person who likes to get attention does not listen to clients and does not see things from their point of view. In fact, the most sociable sellers usually have the worst performance among all. In fact, the most successful sellers are ambivalent in the middle between introverted and outgoing. They can listen to customers, tune in to them and then make the sale. Finally, do not forget the physical component of the tuning: mimic. Humans tend to naturally mimic the accents, postures, and behaviors of others. Research has shown that making use of mimicry and physically incorporating buyer’s tricks can actually increase sales. We are more likely to be persuaded by the people we like. A genuine similarity is a form of human connection, and so we are much more likely to move together with people who share characteristics with us. On the other hand, knowing how to survive rejection and non-rejection is equally important. Knowing how to float in an ocean of rejection is as vital as having attunement and similarity. To deal with rejection, it takes courage, the ability to drift in a sea of no’s and continue to sell day after day, without losing faith. Having a steady faith in your skills and reaffirming this is important. But just reaffirming doesn’t help you in closing more sales. One practical tip to help you motivate yourself is to continually work with mental simulations and questions like “How can we fix this?” when we prepare for a sale. The questions to yourself help you to plan and deal with problems. That is because interrogations force you to work out the answers mentally, thus discovering possible sales strategies and new motivations in advance. Another important point is to stay positive. Research has shown that this helps broaden your perspectives by allowing you to better see customer issues and propose alternative solutions if they reject the initial proposal. Another significant point is the way you deal with rejection after it has happened. Research has shown that a seller who sees rejection as something temporary and external will likely sell more than a seller who sees things as permanent. For example, a salesperson who believes that he has not closed the sale because the customer does not have the resources to implement the product at that moment tends to sell more than the salesperson who believes that he has lost the sale because of his lack of skills. Clarity needs contrast. We understand things better when we compare them to others than when we see them in isolation. Reducing customer options from 24 to only 6 resulted in a 10x increase in sales to a company cited by Pink. Many salespeople and persuasive non-sales people, such as teachers and doctors, have lost their value as information keepers and now need to find a new way to move people. The way to do this is to give clarity to the buyer: the modern role involves helping people to see situations in a new light. The ability to create hypotheses about what will happen is more valuable than the knowledge itself to the buyer. Finding problems has become more important than solutions and the severity of the problem encountered is a sign of the opportunity to create a quality solution. Today consumers can buy anything online, but that does not mean that their problems are being solved. A seller who identifies an issue provides a valuable service. The key to finding the right problem is knowing how to ask the customer about your challenges, subsequently helping them filter out all the available information and thus come up with a solution. Finally, to move people, be sure to give them clear, detailed instructions on how to solve your problem. In the new world of sales, several changes occur. One of the main things is how people make their decisions and take their beliefs. An interesting example: When people find negative information about a product after they have already received positive information, negative information ironically tends to highlight the product’s advantages. Often, being honest about a limitation of your solution can increase the customer’s perception of value. If you show transparency, people will want to believe you! The purpose of presenting an idea is not necessarily to get people to adopt it. The goal is to offer something that starts a conversation, brings the other as a participant and together you come to a result that interests you both. The McKinsey Institute says the average American reads over a thousand words a day. In the age of abundant information, thousands of things compete for the attention of people, and you need to be direct in your presentation. You have little time, so you need to deliver something memorable. Therefore, your presentation needs to be short, and people should participate in it. Daniel says that in presentations, questions can be more powerful than sentences. In a sales situation, you should encourage the customer to contribute your ideas and the easiest way to do it is by asking relevant questions. Questions force people to come up with their own reasons for agreeing with you. They discover possibilities, bring up new issues and even problems. Another tool, though it sounds silly, works is to use rhyming speeches. Research indicates that people subconsciously find that rhyming statements are more accurate than non-rhyming statements. Even adding little swear words to your speech increases your power of persuasion and listeners come to rely more on what you say. Another tip is to deliver your content as an experience, an event and not just a product. People want and like to be part of it. Many vendors like to use scripts for their sales. A script is something that comes from the theater, but sellers must go beyond it. Many companies used to have sophisticated scripts, which included elements such as tone of voice and even body language. In the new sales environment, the script no longer works. You need to go back to its origin in the theater and seek to learn improvisation. In theater, one actor improvises while the other listens attentively and assumes after an opening. To develop your improvisation skills, you need to listen to work on the idea that the other brings. For many of us, the opposite of talking is not listening but waiting. It is necessary to listen actively to know how to improvise, continuing the script initiated by the other. It is also crucial to make the other look good. Actors improvisation work together to improve the group’s outcome, always helping each other. Moving people is not a zero-sum game, and everyone can win. Always look for solutions that benefit both sides, instead of just trying to reach your own interests. In any activity, sales or not, if it involves moving another person, we are more efficient if we can think of the individual more than solving a problem. We must find the higher purpose in what we are doing and transmit it to the people we are trying to move. The personal desire to help people and the desire to make the world a better place are values we all share. If you want to lead and influence people, you will notice that the greatest leaders were not heroic, but actually, they were quiet types whose purpose was related to serving people. To move people and develop your leadership, you need to be a servant leader. Otherwise, you may be seen as a manipulator. You need to pay attention to the outcome of your attitudes. Will my product or service improve your life? When we are no longer working together, will that person’s life be better? A good salesperson needs to know that your product helps humanity altruistically as well as financially. Here we go. End of the line. It goes without saying that Daniel Pink’s book is revolutionary. There are a lot of surprises inside To Sell is Human: The Surprising Truth About Moving Others. I could mention the intriguing case studies, the endless endnotes (see what I did there?) full of information, and lots and lots of other things that make it such an excellent read.